There's nothing like a bright & sunny day. It's even better when it's supposed to be winter. The key is to find balance. It may be perfectly nice when you're in the heat of the sun but once you step in the shade you're in for a chilly surprise. That's why it's always ideal to layer up, which is something I covered in what to wear on a California winter's day. I found that lately I'm not as comfortable wearing jeans & pants. Maybe I need to find the perfect pair? Maybe I need to lay off the carbs? My current trend of choice is tights &/or leggings with shorts. It's warm. It's cozy. It's perfect to keep goosebumps at bay. Who needs those anyway? Love the look! It makes me envious for warm weather. I woke up to a chilling 4 degrees here in Maryland. Love the contrast with your tights and shorts! Cute outfit! I hate wearing pants and jeans too haha leggings are my best friend! What pretty flowers! I can't wait until it is warm where I live. I am sick of the snow and need sunshine like this! This is a cute outfit. I love your rings. Especially the little gold one withe ears! I love the outfit and all of the flowers! wow!! so edgy! love it! This outfit is so cute! I just love your pink shorts. Old gems are often the greatest gems. -23 windchill sounds like 100% torture!! :O! You are so cute and I agree - that is the thing about sunny chilly days. The sun can really trick you into thinking it is warm, but the minute you step into the shade it is freezing! You're wearing that in winter? I hate you right now! I miss the warmth! You look great though, you're so bloomin pretty! This look is so cute...I love the pink shorts! 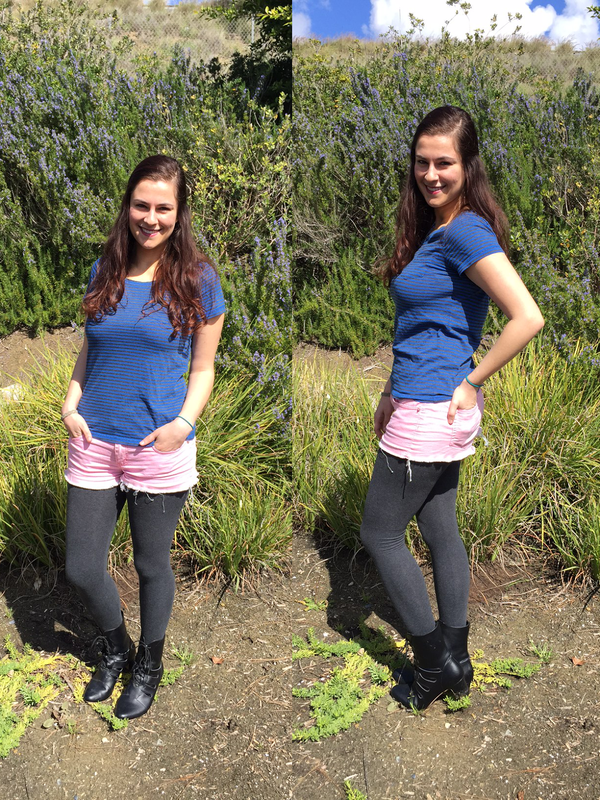 Loving the contrast between the tights, shorts, and top! All the colors work so well together. I'm also not a fan of jeans!! I try to wear anything but!! Love the shorts with the tights under it. Very awesome look and looks beautiful there too!!! Sigh. Short sleeves in February could only happen in such a fabled place as California!! It's wet and windy here, so I'm wrapped up in boots and layers. I dream of wearing shorts again (but probably with tights here!). Great look! I wish we could get some of that warmer weather over here in TN!!! Love this Carmen!! i'm so jealous you live in Cali, I really want to go back, it's been 10 years since I've been! Loving your blog! You’re stunning! Loving this look from head to toe!